Leslie Sackett, a radio officer in the merchant navy, son of Alfred James Sackett and Lydia Hatfield, was born at Les Banques, St Sampson's, GuernseyG, on 23 June 1905.1 He died aged 73 in GuernseyG on 2 November 1978. 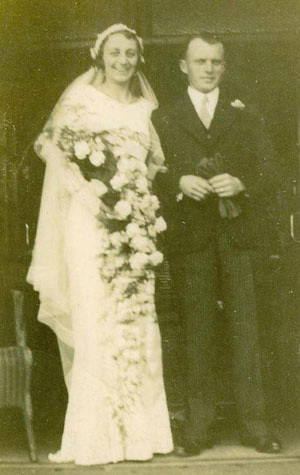 He married on 17 October 1934, Dulcie Lillie Keyho, a cousin, daughter of Thomas John Keyho and Laura Sackett. Register of Births, Guernsey (Guernsey Greffe, Royal Court House), 328/91, "23 June 1905 Leslie s. Alfred Sackett & Lydia Hatfield, b. at Les Banques, St Sampson's. Father's occupation: collector for furniture." "British Postal Service Appointment Books, 1737–1969", digital image, Ancestry.com, "May 1931, 60553, Sackett, Leslie, cert wless opr." "UK Railway Employment Records, 1833–1963", digital image, Ancestry.com, Great Western, register of uniformed men, "staff no. 92322 Sackett, Leslie, b. 23-6-05, appointed 8-11-37."